Thank you Nasoya for sponsoring this post. Nasoya is one of my favorite brands of tofu because it’s organic, non-GMO, and it’s an easy way to add more plant-based meals into my week. 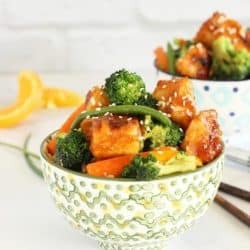 I have no idea who General Tso was, but I’m really glad he invented this sweet, spicy sauce that works just as well with crispy tofu, as it does with the more traditional chicken. 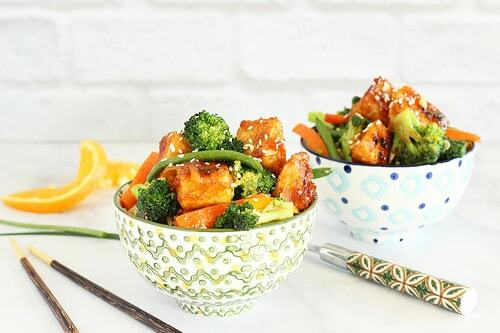 I’ve always been a fan of baked tofu, but I learned the best trick to make the super crispy tofu in this recipe from the brand new Chloe Flavor cookbook. Vegan chef Chloe Coscarelli partnered with Nasoya on this book, and she’s quite the expert on all things tofu – and plant-based meals in general. First, let me say, if you’re at all unsure about tofu, you’ve got to try this recipe. And, if you’ve had tofu before and decided you didn’t like it’s “slippery” texture – you’ve gotta try this recipe! The first step to using tofu in any stir-fry dish, is to buy firm or extra firm tofu. Next, drain off all of the water from the block, and then press it for a few hours to remove any water that’s inside the block of tofu. Think of it as a sponge that you have to wring out. If you skip this stip, it will be slippery. I LOVE my tofu press because it gives me best results, but in a pinch, you can also put the tofu block in a strainer, place a few paper towels on top, and weight it down for at least 60 minutes with a heavy pot. Once the water is pressd out of your tofu, you’re ready to roll. The beauty of that block of bean curd is that it absorbs any flavors you add to it, so it’s really a blank canvas. I love to marinate it in a maple soy sauce, or peanut sauce, and then bake it until it’s firm and chewy. However, now that I’ve tried this crisping technique – I think this might be my new favorite way to do tofu. The secret, I learned, is to dust it with cornstarch. Cut the well-pressed block into squares, triangles, or any shape your heart desires. Pour about 1/4 cup of cornstarch into a ziploc bag, add your tofu squares, and give it a good shake to coat all of the pieces. Then saute those coated pieces in a bit of cooking oil (I recommend a non-stick pan) until they get firm and crispy. Kind of like little pieces of fried chicken in traditional General Tso- but way healthier. Trust me – try it. You’ll really, really love it. I tweaked the original recipe just a bit to add more vegetables, and just a little bit of thai chili pepper for more spice. SO sweet, spicy, sticky, good. I can’t wait to try more delicious recipes from this cookbook. Bring the rice, water, and salt to a boil. Cover, and reduce heat to low. Let the rice simmer for about 20 minutes or until the water is absorbed. While the rice is cooking, combine the maple syrup, tamari or soy sauce, Sriracha, orange juice, and cornstarch in a measuring cup and stir well so that the cornstarch is dissolved. Set this aside. Cut the tofu into cubes, place them in a ziploc bag, and sprinkle with the 1/4 cup of cornstarch. Shake gently to coat the tofu with the cornstarch. Heat 2 tablespoons of the canola oil in a nonstick frying pan until it starts to shimmer. Add the tofu pieces in a single layer, leaving some room between the pieces. Sear the tofu for about 3-4 minutes on each side. Do not lift it up until it starts to turn golden. If necessary, add more oil as needed. When the tofu is golden and crisp, turn the heat off, and add about 1/3 of the stir-fry sauce to the pan. The sauce will thicken quickly, so stir to coat the tofu with the sauce. Remove the tofu from the pan and set it aside. Add the broccoli, carrots, and green beans along with about 3 tablespoons of water to the pan. Bring the water to a boil, cover, and let the vegetables steam for about 1 minute. Uncover the vegetables, and let the water evaporate. Add the remaining tablespoon of canola oil to the pan, along with the scallions, orange peel, garlic, ginger, and chilis. Turn the heat to medium-high, and stir-fry the vegetables until they just start to turn brown in spots. Add the remaining stir-fry sauce to the vegetables, and stir to thicken and coat the vegetables. Add the crispy tofu to the vegetables and stir to combine. 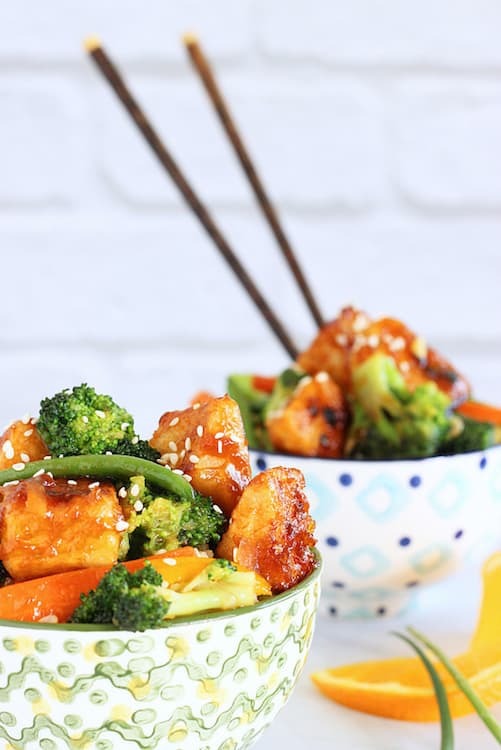 Serve the tofu and vegetables over the rice, and garnish with sesame seeds, if desired. Do you like tofu, or are you afraid of it? Do you know who General Tso was? Be brave, and eat well! Excited to try this; I’ve been looking for more tofu based recipes! I think I’ll try the sauce as a marinade as well as glaze. I do have a recommendation for a change to the post. There are 2 pictures where you have chopsticks sticking strait into the dish of food. This is a big no-no in Asian cultures! It’s how offerings made for the dead and is also similar to the incense used in offerings to the dead at temples. To stick them in the food/rice is taboo & bad luck (even offensive to some). Honestly, there are some interesting rules around chopstick use. *chuckle* I’ve had to learn them as my husband (& in-laws) are Japanese. *tips hat* Thanks for understanding. Hi Robin – Thanks so much for stopping by and for your super informative comment! I’ve never heard that about chopsticks (but I’ll admit I have zero experience with Asian anything) and now I’m really worried that I’ve offended a whole bunch of people and will have bad juju as a result 🙁 I was really just looking for a way to fill the white space above that bowl!